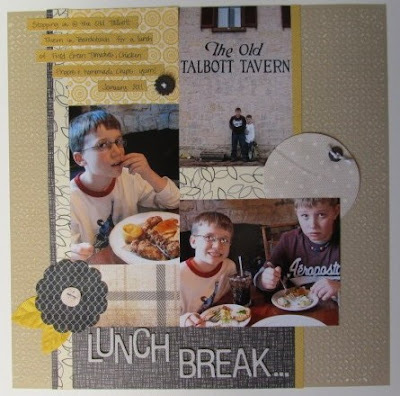 When I saw the preview of the November "Handmade" kit from Studio Calico, I didn't love it. I thought that would change when it arrived, but I still wasn't in love. Don't get me wrong, it was a nice kit and I felt like I had my money's worth in supplies. There just wasn't anything that jumped out at me - no ideas for photos to pair up with it instantly. So, this kit became my challenge. Unfortunately, my first attempt at using the kit failed. I had purchased some coordinating products from October Afternoon to pair up with the kit. I realized after my first layout that few things that ended up on the page were from the kit! But, I had B's first trip to the orthodontist for prep documented. 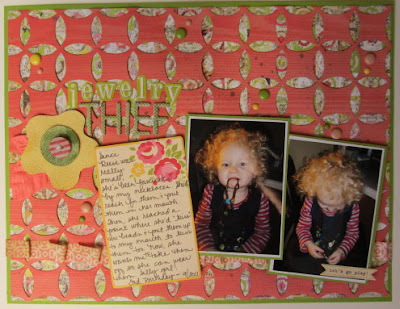 The cardstock was from the "More Color" add and the red alphas, journal card, flag and brads were from the "Tatting" add-on. Nothing came from the main kit. Oops! 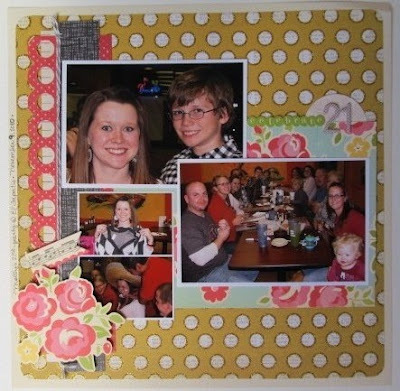 I used a sketch from Allison Davis' Sketches for Scrapbooking Vol 8. For my next layout, I pulled out my LEAST favorite paper by MME. Gold. Glitter. The word ADORE. Huh? Well, I adore my niece Reese. And so, a layout was born. I actually like it. I used a die cut paper from the kit as a mask for my next layout. Love Mister Huey mists. Used a few on this one. Didn't really like the Basic Grey canvas flowers in the kit, so I used the plain backsides that I also misted and then layered them. This ended up being my favorite layout this month. Another Reese page. 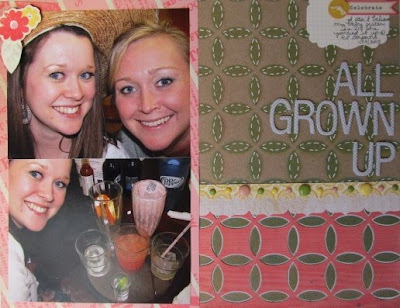 Used the die cut paper to cover up another sheet that I wasn't in love with. You've seen this layout before. (Here.) Next is a lift of page 2 of "Havin' a Merry Christmas" layout by Kim Watson in Nov/Dec '11 CK (page 29). 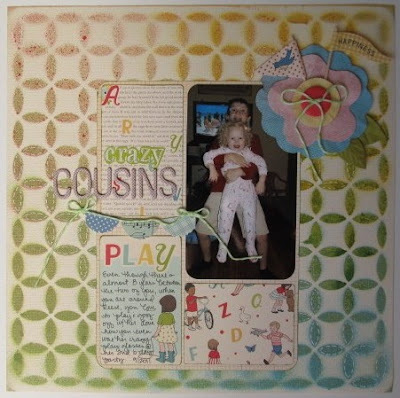 Finally, my last layout was inspired by "Persistence & Snow Tires" layout by Sarah Webb on pg. 38 of Nov/Dec '11 CK. I am a bit behind in sharing my layouts. In the past couple of weeks I have "killed" FOUR of my Studio Calico kits. Go me! The scrapping bug is back. Now, I just need to get my space organized. I have put scrapping on hold a bit while I reorganize my scrap area. Cubes have been moved to fit my needs. Now I just need to organize and fill them back up. Love your layouts! You did a great job with this kit! How have I missed this post? 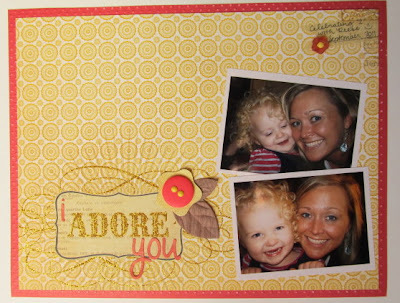 You are so amazing at using your kits and challenging yourself to use your not-such-favorites. I love that you used the gold layout you were not a fan of! It looks great! You are always good at stretching your supplies AND using it up! Great job!